Callum Higgins is senior product analyst at RMS, and is based in London. He joined fellow employees from RMS and RMS clients on our annual Impact Trek in Nepal during March this year. This is Callum’s account of his time in Nepal. On the first day of the Impact Trek, we were based at Build Change’s office in Kathmandu, hearing about the various projects the charity is working on in Nepal from Jessica Stanford (Housing Reconstruction Program Manager), as well as the technological innovations Build Change is using to increase the efficiency of their work from Adam McDonald (New Frontier Technology Architect). 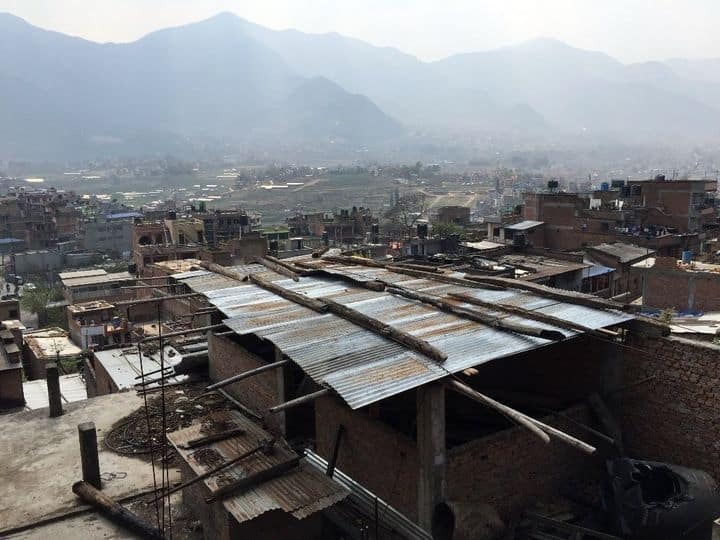 For day two, the Impact Trekkers were keen to get out of the office and into the city to examine some of the typical property construction in the region and the challenges that Build Change faces in making a greater proportion of these safe from earthquakes. The funding that followed the devastating Mw 7.8 earthquake in April 2015 has allowed Build Change to have an impact during the reconstruction process. This is reflected in the design and construction of new earthquake-resistant properties, retrofitting of damaged houses, and by training local people in earthquake-resistant construction practices. So far, this work has been focused primarily in rural areas where the earthquake damage was greatest, but as attention begins to shift from reconstruction to future earthquake resiliency, Build Change is also interested in the possibility of additionally employing retrofitting in more populated regions such as the Kathmandu Valley. However, convincing stakeholders such as homeowners to fund retrofitting for their undamaged homes in order to protect inhabitants against future earthquakes can be a difficult prospect. Kathmandu is one of the fastest growing metropolitan areas in South Asia, driven by rapid urbanization. 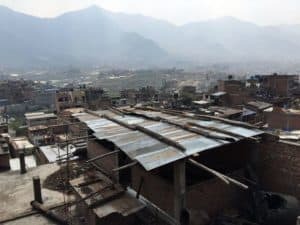 This has resulted in the haphazard and uncontrolled growth of built-up areas, often with irregular and substandard housing vulnerable to earthquakes. 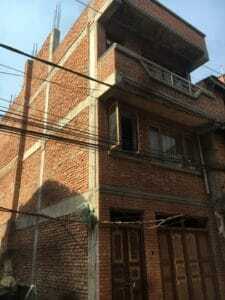 Examples of masonry construction in Kirtipur. The house on the left of the image exhibits some signs of cracks in the wall, likely due to earthquake damage. One area where this is particularly noticeable is Kirtipur, located five kilometers southwest of Kathmandu city center, and the destination for the day’s activities. One of the five municipalities in the Kathmandu Valley, this ancient city known for its Newari culture and many temples, dates back to 1099 A.D. However, its once rural surrounds have been replaced by urban development, while construction in the city itself has been substantial and is still ongoing. This was immediately clear upon arrival with piles of bricks and rebar lining the streets, ready for use in construction. Adam, our host for the day, had previously visited Kirtipur to capture panoramic street-level views through a transect of the city using a 360-degree camera and a smartphone. This imagery has been uploaded to Mapillary, a crowdsourced street-level imagery platform. By tagging these photos with information such as a building’s construction type, the hope is that an inventory of property types in a community and their vulnerability to earthquakes could be created to assist in highlighting the benefits that retrofitting would bring. The aim of a further visit from the Impact Trekkers was to share our catastrophe modeling experience and identify data that might be useful to tag within these images, to help determine the relative vulnerability of different properties. typically three to five stories in nature. Likely earthquake damage could be seen in places for some of the masonry buildings. 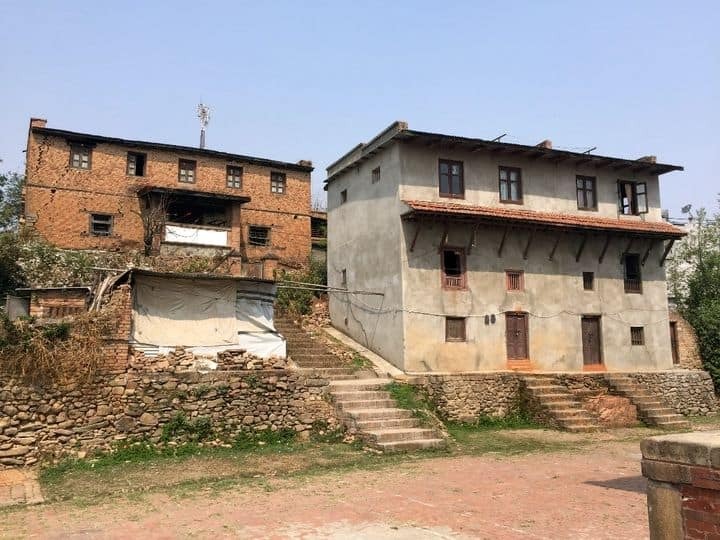 These buildings could be prime candidates for retrofitting, given building designs are similar to the building design that Build Change has performed retrofitting work for in other regions of Nepal. Not only improving earthquake safety, retrofitting such buildings also helps to avoid them being replaced by more modern construction, aiding communities in retaining their historic character. Despite generally being newer and better constructed, reinforced concrete frame buildings in Nepal can also often be vulnerable to earthquakes, with most being non-engineered buildings and some having weak columns. Soft stories (floors with large openings where internal walls would normally be required for stability) are also a major risk for some of these buildings, with many occupied by open-plan ground floor shops. As such, large numbers of the reinforced concrete structures observed could also significantly benefit from retrofitting. However, Adam explained that retrofitting work for some of the reinforced concrete frame buildings would require a more bespoke, time-consuming and expensive approach due to the complexities of reinforced concrete construction as compared to masonry. The tour was rounded off by lunch in the local community restaurant Newa Lahana, clearly a popular haunt for students from the nearby Tribhuvan University. Providing a lively atmosphere, city views, and Newari food aplenty, this provided the perfect opportunity to discuss the observations made during the morning before our return to the Build Change office. Based in London, Callum works within the Model Product Management team at RMS, focusing on the Australasia climate suite of products. As product manager for the Australia Cyclone and Severe Convective Storm models, Callum works with the RMS client facing and model development teams to translate market needs into model improvements and provides subject matter support for these models. He joined RMS in 2014 and prior to his current role supported a variety of models within the Model Product Management team through both technical analyses and the creation of product marketing materials and documentation. Callum holds an integrated master’s degree (MEarthSci) in Earth Sciences from Oxford University.